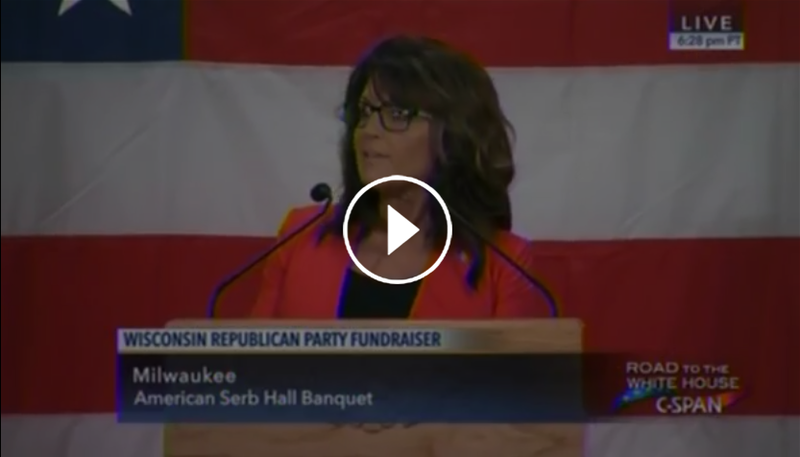 Speaking on behalf of Donald Trump, Sarah Palin gave a speech last night to a Wisconsin Republican audience. Standing firmly on a platform of truth, Palin warned the mostly party (establishment) audience their decision to stand with deception in order to win an election also means placing themselves in a very precarious position. The response from the audience to Sarah’s brutal honesty was what’s customarily known as “the collective nervousness of deceivers“. Whenever anyone dares to tell the collective: ‘the emperor stands naked’; there’s a particular kind of autonomic group nervousness immediately evident. A group discomfort. 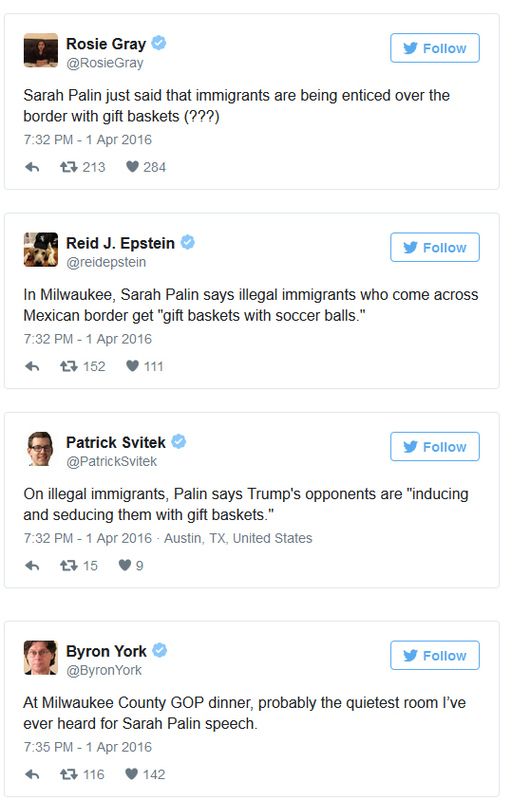 Such was the discomfort when Sarah Palin mentioned Senator Ted Cruz’s weak and opportunistic immigration position, and then contrast a real-life example of Cruz going to McAllen Texas (Saturday, July 19th 2014) to hand out “gift baskets” and welcome illegal alien families. You could hear a pin-drop as an entire audience sat jaw-agape in disbelief. Perhaps the reason the entire Professional Republican audience reacted that way was because they preferred NOT to know. Or, then again, it could be because the example Sarah Palin was giving was widely hidden by the media. On the left that’s Senator Ted Cruz unloading the boxes of goodies. On the right is the illegal alien families who received the goodies (toys, stuffed animals, soccer balls etc). “Humanitarian Crisis”? The entire event was essentially based on fraud. The fraud was the Obama administration claiming that hundreds of thousands of “Unaccompanied Alien Children” (UAC) were arriving on the southern border en masse, and needed to be cared for. The entire administration talking point was complete nonsense, but the media helped sell the ridiculous story as if it were real; and Ted Cruz and Glenn Beck helped perpetrate the fraud by claiming there was an urgent “humanitarian crisis”. There was neither. The reality was the influx of illegal border crossers were factually entire families, mostly from Mexico but also from Honduras, Guatemala and Panama. The Obama administration had specifically kick-started the South American migration approximately a year earlier, and the families were showing up as an outcome of the State Department coordinating the exodus. Almost everything about the crisis was a sham, including DHS Secretary Jeh Johnson going before an emergency congressional committee and demanding $4 billion (that’s billion) to deal with the “humanitarian crisis”. These were not “children”, they were entire families – and, as you can see from the pictures, these were entire family units. We have tens of thousands of American kids in inner-city areas in as much of a crisis as the illegals we allowed to pour across the border; but we don’t see Jeh Johnson demanding $4 billion for the American children. Charity begins at home; at least it should. So Sarah Palin brings some BIG TRUTH to those GOP insiders who gathered in Wisconsin; and, if we are to give benefit-of-the-doubt to those who heard it, apparently it’s the first time they became aware of Senator Cruz’s forked tongue on an issue. Hence, a gob smacked response. Palin also pointed out another lie, when she reminded everyone that Senator Cruz never stopped the senate Gang-of-Eight amnesty bill. Despite Lyin’ Ted claiming on the campaign trail that he killed the bill, the reality is that bill passed the Senate in 2013, and it would have passed the House were it not for Dave Brat’s primary defeat of Eric Cantor in June of 2014 shortly before Sentor Cruz took off to the border with his gift baskets. But Sarah didn’t stop there. She also fearlessly told the audience that Senator Ted Cruz was also lying about another policy aspect, his advocacy for the Trans-Pacific Trade Deal. And, more specifically, to the Trade Promotion Authority bill Senator Ted Cruz co-authored, co-planned and co-constructed, along with Paul Ryan in the House of Representatives. Again, Sarah was loaded with the truth. The Republican disbelievers didn’t want to hear about that inconvenient reality either. Then again, when you stand boldly in sunlight the cockroaches never approach; they can only comfortably co-exist when they remain cloistered in the dark shadows of deception. The media’s response to Palin’s speech? Well, initially (and immediately) they began accusing her of lying about the “gift baskets”. Then, after they realized everything she was saying was factual, they started spinning. Eventually, they dropped the subject – and that’s probably how it will remain today. It’s easier to hide those uncomfortable truths that way. Well, at least until after the Tuesday election I guess. Previous PostCYRUS: GOD’S ANOINTED SHEPHERDNext PostTrump Owes Soros 160 Million Dollars?